One of the pieces I’ve been proudest of to date was using Holly McQuillan’s Zero Waste Long Coat Pattern from her Make/Use Project. The pattern uses a single piece of fabric and through cutting and rotating pieces can be reassembled into a coat without wasting a single piece of fabric. Theoretically you could pull apart your garment and return it to a single piece of fabric should the need arise. Painting on the cut lines. The first step was painting out the pattern onto a piece of fabric. The paint used is recycled house paint, leftover from Josh building us an outdoor table and bench set. The house paint is heavy enough to soak through the fabric and seal the edges whilst eliminating the need to overlock or finish the seams in some other sewing method. The idea behind this is that it removes the need for technical sewing knowledge or specialist sewing equipment meaning that anyone can make their own clothing. McQuillan suggests that by democratising the clothing manufacture process in this way consumers will be able to have a closer relationship with and appreciation for their garments. One of the skills I wanted to explore in this process was shibori, or indigo dyeing. I used a range of wrapping, folding and binding techniques to achieve the different patterns on each piece. 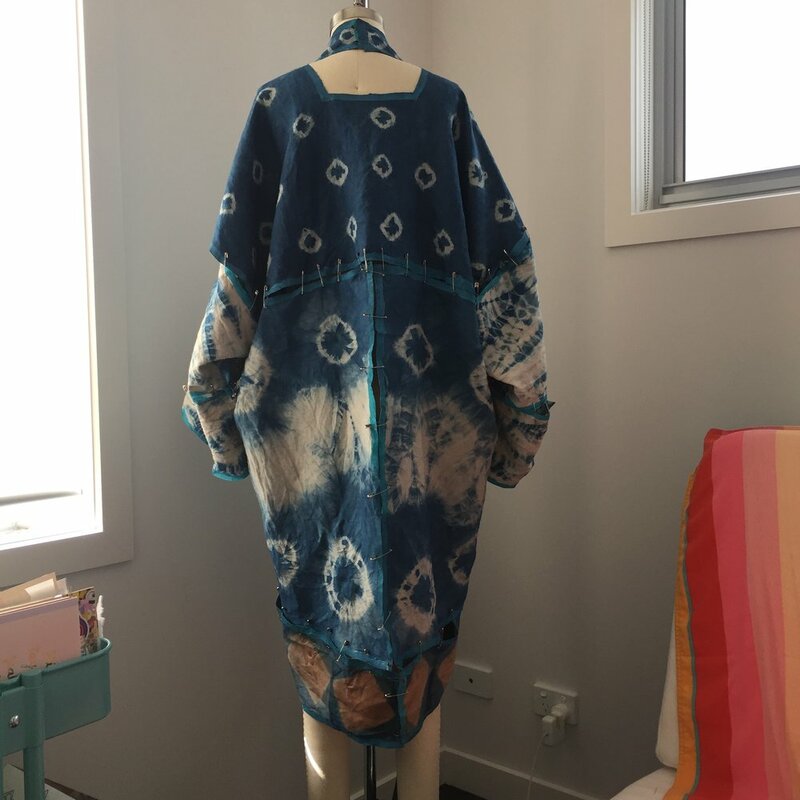 I tried to take a considered approach that allowed for symmetry between the pieces whilst stll maintaining the slightly unpredictable beauty and nature of the shibori method. I used embroidery to mark the symbols on each piece so that I would be able to reconstruct the pieces. The rotation of pattern pieces to make the coat fit comfortably and drape appropriately was definitely the trickiest part. There was a lot of trial and error in rotating the sleeves as there was no guide to matching the symbols. The entire long coat is assembled by hand stitching. I normally avoid sewing anything by hand like the plague. But in the case of this coat the sterility of machine stitch wouldn’t have suited it and really would have defeated the purpose of being able to make the garment without specialist machinery. As such the pieces are assembled using a decorative insertion stitch. The stitches are really pretty and leave a slight gap between the pieces that allows the light to move through the piece in a really appealing way. Overall I really enjoyed putting this coat together and I was so happy with how it turned out. I think the insertion stitches work really well together with the shibori to create a natural look. The only thing I would change if I were to make another one is that I would probably skip the house paint and finish the seams in a cleaner way, probably by stitching. I think this would improve the overall look and drape. 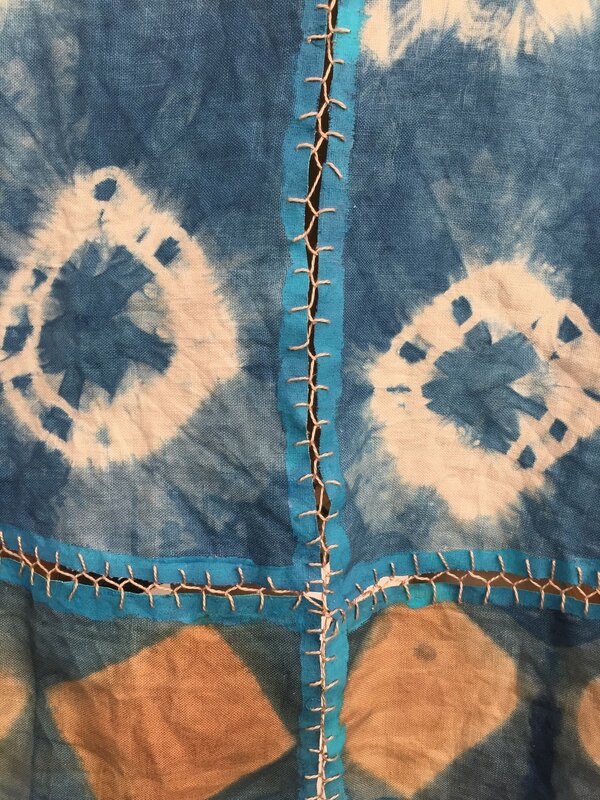 Exploring Shibori and Zero Waste techniques.